the big brand sale special christmas edition giveaway: win a gift certificate to shop the event! Hey guys! The BIG BRAND SALE IS HAPPENING AGAIN! Now's your chance to shop your favorite premium brands at up to 80% off!!! Why not take advantage, beat the Christmas Rush and get your Christmas shopping done with the biggest discounts ever! Made For Your Marketing is giving away FREE TICKETS to the Big Brand Sale + a P1,000 shopping certificate to 1 lucky winner! 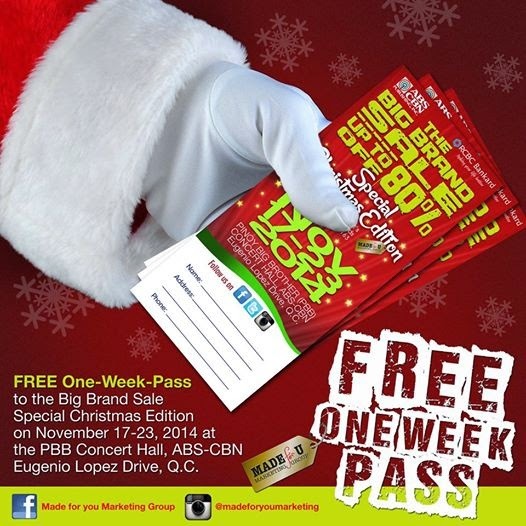 Be one of the first 500 to get in for free at this awesome week-long Christmas shopping event! 2. Like and share this photo with caption: "Let's go and shop for a good cause at the Big Brand Sale this Nov.17-23 at the PBB Concert Hall!" There's more! Leave a comment below by completing the statement: "I'm so excited to shop at the Big Brand Sale because _______", and get a chance to be the lucky winner of Php1,000-worth shopping certificate to be used at the Big Brand Sale - Special Christmas Edition. Winner will be chosen by Nov. 16, 2014. Good luck and see you at the Big Brand Sale - Special Christmas Edition! "I'm so excited to shop at the Big Brand Sale because I get to make a meaningful difference in someone's life this Christmas! "I'm so excited to shop at the Big Brand Sale because I love bargains and gift shopping!" the chance to rub elbows with ABS-CBN stars!!! Im so excited to shop at the Big Grand Sale because I want to buy an early Xmas gifts for my kids and to see Kapamilya Stars!